b) Intervene rapidly and appropriately to stabilize the patient. If cardioversion fails, try amiodarone load or diltiazem. b) Periodically reassess the need for anticoagulation. 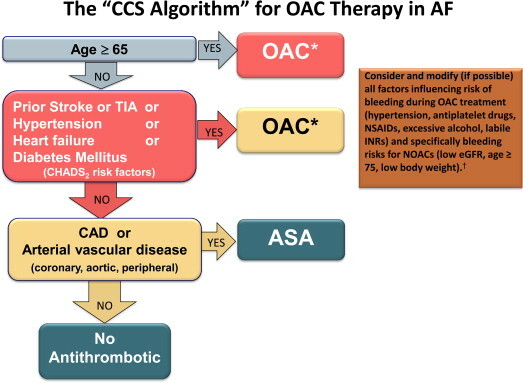 4 In patients with atrial fibrillation, when the decision has been made to use anticoagulation, institute the appropriate therapy and patient education, with a comprehensive follow-up plan. 5 In a stable patient with atrial fibrillation, identify the need for rate control. The rate control approach consists of ventricular rate control, OAC, and delayed cardioversion after 4 weeks if indicated. Added therapy with beta-blockers or CCB in pt whose heart rate remains uncontrolled. 6 In a stable patient with atrial fibrillation, arrange for rhythm correction when appropriate. 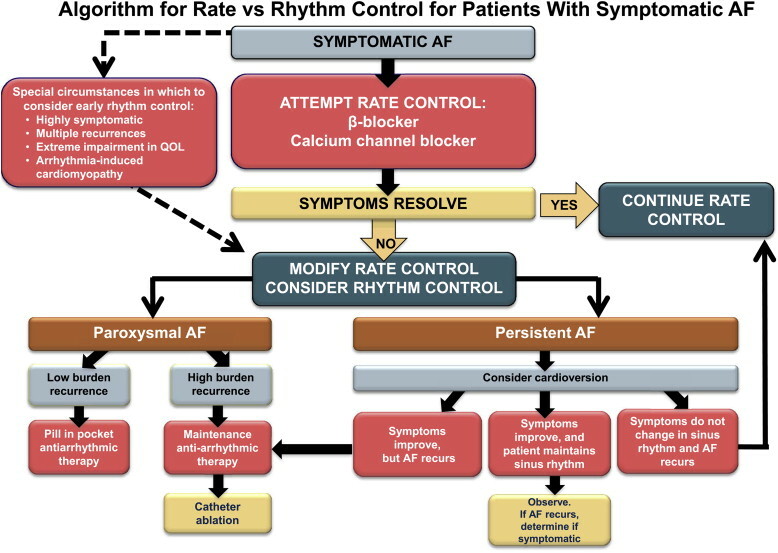 Rhythm control for pt who remain symptomatic with rate control Tx, paroxysmal, age <65, no HTN, CHF exacerbated by AF or in whom rate control is unlikely to control symptoms. Thromboembolic event highest in patients with older age, heart failure, or diabetes. 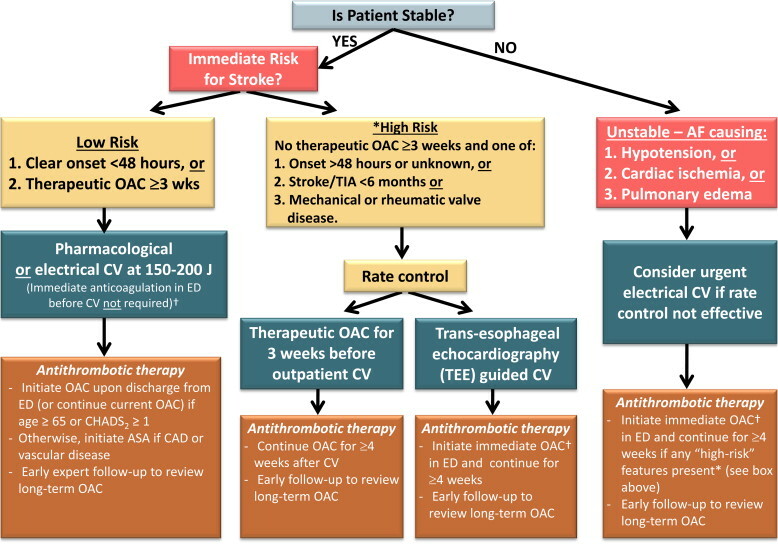 For patients with no high-risk factors for stroke (recent stroke or TIA within 6 months; rheumatic heart disease; mechanical valve) and clear AF onset within 48 hours or therapeutic OAC therapy for ≥ 3 weeks, they may undergo cardioversion in the ED without immediate initiation of anticoagulation.